We excitedly anticipate puppies this late spring of 2019 - doing the "puppy dance" for confirmation soon of a beautiful litter of strong, healthy pups. We will put up more details once we confirm pregnancy. ​Look forward to updating very soon! If you are interested in a puppy, please be sure to fill out our puppy application by clicking here. sooner rather than later helps us both in developing the good relationship that is so important! Even if we do not have a puppy for you, we are happy to help you find another pup and also support and assist you in considering one of the many fine dogs in rescue. We are privileged to share our lives with these intelligent, beautiful and wonderfully engaging dogs, and we are glad to share with you a bit about them through this website. Here you will find information about the breed; rescue; and our program here at Gryphon. 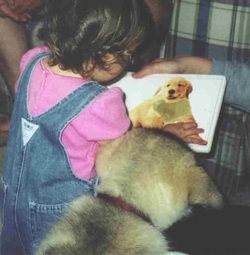 Our dogs are friends, companions and partners in living life. We participate in a number of activities here in the beautiful Pacific Northwest, from conformation (shows) to sledding & carting, back-packing to weight pull, occasional dabbling in obedience and agility, and, well, just about anything that makes for a great outing and happy dogs!! and are proud of our versatile, capable dogs. We're working on re-building our new website ... be sure to stay tuned as we get everything up, and thank you for your patience! See our blog for news as new pages are loaded/updated. Here at Gryphon Alaskan Malamutes, we strive for dogs that represent the spirit of their ancestors - beautiful, but most importantly strong, sound and healthy. Our Philosophy: Never forget the basics. Temperament and health is our first consideration. First and foremost, Gryphon dogs are beloved family members in both our home and others. Therefore, basic health & an extraordinary temperament are fundamental factors always front and center in all of our breeding considerations. Ribbons, working titles, and accolades are all quite nice, but the most meaningful aspect of your dog is the life you share with him or her. We take that to heart. In addition to sharing our lives with these incredible dogs, we breed because we admire and deeply respect this breed and its history, and believe participating in that legacy by working to help preserve and promote the special qualities of this breed to be a noble pursuit. We take that role, and its obligations, very seriously. Thus, we breed only when we have a match we truly feel will make a positive contribution to the breed and our program. And, above all else, the prospect for happy, healthy puppies. In honoring the malamute heritage, we value preservation of the working spirit and ability of this magnificent breed. Malamutes are tremendously versatile, and should exhibit the working drive and ability that guided the evolution of the breed for thousands of years in the harsh arctic in addition to demonstrating a sound conformation that exemplifies the AKC Alaskan Malamute Standard. So we believe strongly in working the dogs (mostly sledding and packing) as well as testing them in the show ring, and those attributes are cornerstones in our breeding decisions. For more information on working with your Alaskan Malamute, and to see our working dogs at Gryphon, click here! As they say, there is something for everyone in this world. Malamutes are not for everyone. Their stubborn and independent nature, coupled with an acute intelligence and a strong sense of pack dynamics, offer unique challenges - and unique joys - in sharing your life with such a dog. And, a commitment to a dog is a commitment for life! So the final bit of our philosophy is helping ensure that our puppy people and others we help in giving a malamute their forever home are the right match both for this breed, and their individual companion. We want to help guide you to what is right for you and your dog, wherever you may get your dog and whatever breed you ultimately decide is right for you. This is part of what ensures a "forever home"! for the dog you welcome into your life. And, if you are lucky enough that malamutes are right for you, you are in for an extraordinary experience! and we are here to help you in that amazing adventure. So, welcome to our site! 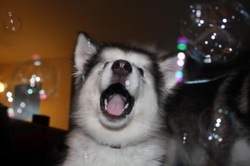 On this site you will find a little about our plans and activities at Gryphon Alaskan Malamutes, and educational information about the Alaskan Malamute in general. If you are wondering if this is the breed for you, or whether you would be better suited to adopting a pup, a young adult, an older dog or one of those very special seniors, please enjoy the various information sources and links on this site and elsewhere. To ensure a happy match for both you and your dog, please take the time to research the breed and talk to people with experience in the various facets of Malamute ownership. There is no such thing as too much learning! Also, be sure to look at local rescue sites to see if your perfect companion might not be there waiting for you! 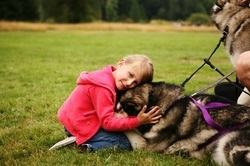 If you are considering adding a Malamute to your family, we are happy to help you learn more about the breed and help you find the right dog, and the right fit, whether that be a puppy from us or from another responsible, caring breeder; or in giving a home to a beautiful rescue malamute who is looking for that perfect place. Remember (it bears repeating) that getting a new puppy is not the only way to share your life with a malamute ... please also consider whether a rescue dog might be what you're looking for. 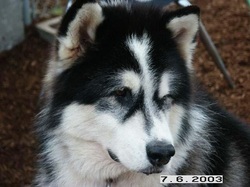 There are many wonderful malamutes in local rescue programs that can fill that spot in your life and warm your heart. We are happy to help you with this as well! Enjoy the site and our babies! and feel free to contact us with any questions, comments or just to share stories.